UPDATE: 2:00 p.m. SUNDAY, ALL ABOUT THE BENJAMINS: We (OK, I) aren’t econ majors here, but we’ll try to offer our best financial analysis of the Notre Dame and Duke athletic departments that our limited knowledge provides. According to the 2006-2007 Notre Dame annual athletics report, the Fighting Irish have a budget of $44.5 million, slightly less than Duke’s operating budget of $47.4 million, as stated in the University’s own 2006-2007 annual report. Most notably, though, was the schools’ revenue disparities. Notre Dame, under White’s watch, made $16 million in total revenue in the last fiscal year, in part because of the football team’s trip to the BCS Fiesta Bowl in 2006. We couldn’t find any specific numbers for Duke, but it is widely known that the football team and women’s basketball team–both considered “revenue sports”–are anything but, racking up losses for the athletic department. In the new strategic plan section about finances, the author writes, “Our expenses exceed our income, and have for several years.” There are a few reasons for these losses (a paltry University subsidy, rising salaries of coaches, competitive market, lack of endowed scholarships, among others), and even if Duke is not in the red, it’s certain that the Blue Devils don’t come close to making $16 million a year. Notre Dame Football is iconic in the way Duke Basketball is, but football makes more money, and that’s another challenge the business-minded White will encounter at Duke. But if David Cutcliffe can turn the Blue Devils into a winning program, the solution might be easier than White could have ever hoped. UPDATE: 1:30 p.m. SUNDAY, WHAT THEY’RE SAYING: There are enough stories about White’s introductory press conference to get you through your bagel and coffee this morning, but one that stood out, ironically, came from a Notre Dame fan website. White took the heat for most of the Fighting Irish football team’s transgressions, most notably in the coaching ranks (for the record, a similar story appears in the Chicago Tribune). The firing of Tyrone Willingham after three seasons is still one of the more heated issues in the country, and this site argues that White took the blame even though it probably wasn’t his decision. That particular site sees Duke as a chance to regain some of that trust and power, especially within the football program. “Joe said to me, ‘I think it’s in pretty good shape, Kevin, but there are some opportunities here,’ and I can’t agree more,” White said. “I believe that if you were to talk to anybody at any of those schools during the time he was there, they would have been quite surprised to learn that he hadn’t always been attached to the place, because he is famous for the degree of his commitment and the degree of his passion,” Brodhead said. Of course, White was hired over some candidates with well-worn ties to Duke. Mike Cragg, an associate athletic director and director of the Legacy Fund, and Leo Hart, a former Duke quarterback and successful business executive, both expressed interest in the position. Both are fairly business-oriented, as is White, who taught an MBA class on sports business at Notre Dame’s Mendoza School of Business and will consider teaching at Fuqua School of Business, too. For the record, White’s job officially begins June 16. UPDATE: 3:20 p.m. SATURDAY, WHO’S WHO: For those wondering, here’s the list of people we spotted this afternoon at the press conference in Yoh, other than Brodhead and White: Mike Krzyzewski, men’s basketball head coach; Sean McNally, baseball head coach; John Burness, senior vice president for public affairs and government relations; Roy Bostock, chair of the search committee and Yahoo! Inc. chairman of the board; John Mack, Trustee, member of the search committee and CEO of Morgan Stanley; Chris Kennedy, interim athletic director. White was joined by one of his daughters, one of his sons and his wife, Jane. He has five children. UPDATE: 3:05 p.m. SATURDAY, THROUGH THE LENS: Online photo editor Lawson Kurtz made it out to Yoh to take some photographs of the press conference. You’ll see some shots throughout this post now. UPDATE: 3:00 p.m. SATURDAY, CHRONICLE COVERAGE: The first full story of White’s introduction is up on The Chronicle’s website. I caught up with Mike Krzyzewski after the press conference, and he said he spoke with Brey yesterday about White. UPDATE: 1:46 p.m. SATURDAY, 3.5-HOUR MEETING: This is White’s first trip to Durham in this capacity, but Brodhead and White had a three and a half hour conversation in person on Wednesday morning. White wasn’t necessarily an official candidate then, but he was being treated more as a consultant after being approached by Gene Corrigan, the former ACC commissioner. UPDATE: 1:28 p.m. SATURDAY, “EUPHORIC PLUS PLUS”: In his departing conversation with Father Theodore Hesburgh, the iconic leader of Notre Dame, White told him he was headed to Duke. “That’s the only place I’d give you a blessing,” Hesburgh told White, who met with Mike Krzyzewski this summer and taught Joanne P. McCallie in graduate school. White spoke with former Director of Athletics Joe Alleva this morning and placed a call to fellow former athletic director Tom Butters, too. We’ll find out more about White and Krzyzewski’s relationship. Head football coach David Cutcliffe also has known White for “quite some time now” and White’s son, Michael, was a captain at Ole Miss when Cutcliffe was the head coach for the Rebels. John Swofford, the ACC commissioner, also had lauding praise for White. UPDATE, 10:05 a.m. SATURDAY: Duke has announced it will be holding a press conference today at 1 p.m. in Yoh Football Center to make a special announcement regarding its Department of Athletics. We’ll be there on the scene and let you know as soon as White’s hiring becomes official. 11:30 p.m. FRIDAY:The News & Observer is reporting late Friday night that Duke is expected to hire Notre Dame’s athletic director, Kevin White. If the report is accurate, White will replace Joe Alleva, who took the same position at LSU in April. Duke officials could not be reached for comment Friday night, nor could White. Before he was Notre Dame’s athletic director, White, 57, held the same position at Arizona State, Tulane, Maine and Loras College. He received his undergraduate degree from Central Michigan and his Ph.D. in education from Southern Illinois. At Notre Dame, he hired Charlie Weis, but also hired George O’Leary, who was forced to resign because of inaccuracies on his resume, and Tyrone Willingham, who was fired after three seasons at the helm. The Fighting Irish finished 3-9 last year, beating Duke Nov. 17. In White’s time at Notre Dame, the football team compiled a 57-40 record and did not won a bowl game. In what seems like curious timing, White and his wife, Jane, were named honorary alumni by Notre Dame Wednesday. Only 37 others in Notre Dame history have been awarded the honor, one of the most prestigious the school gives for “unique contributions that singularly qualify them for special recognition as members of the Notre Dame community and family.” They were the first athletic representatives to receive the award since 1997. “I know of no two individuals who exhibit the great spirit of Notre Dame any more than Kevin and Jane do – they are Notre Damers through and through,” said Richard Nussbaum, president of the Alumni Association Board of Directors. In a Thursday interview with The Chronicle, Richard Riddell, the search committee’s vice chair, pinpointed two criteria that seem to describe White perfectly. Communication: White hosted a weekly, hour-long radio show in Chicago and also had a pre-game segment on Westwood One before Notre Dame football games. Recreational sports: With a Ph.D. in education, White was responsible for a “comprehensive intramural, club sport and campus recreation program, with 95 percent of the student body participating,” according to his official biography. He also taught a sports business course at Notre Dame’s Mendoza School of Business. The revitalization of Duke’s recreational sports was stressed in the school’s first athletics strategic plan, approved by the Board of Trustees in May. In 2006-07, he was president of the National Association of Collegiate Directors of Athletics and was the 2005-06 president of the Division I-A Athletic Directors Association. He is also part of the steering committee for Chicago’s quest to host the 2016 Olympics. On Thursday, Riddell told The Chronicle that the committee would likely present President Richard Brodhead with a list of candidates sometime in June and the president would proceed from there. White, the athletic director at Notre Dame since 2000, has no connection to Duke, a trait that Riddell also talked about. When White was introduced at Notre Dame in March 2000, he discussed his overarching idea of an athletic department. Keep checking The Chronicle and The Chronicle’s Sports Blog for more updates and confirmations about this potential hiring. 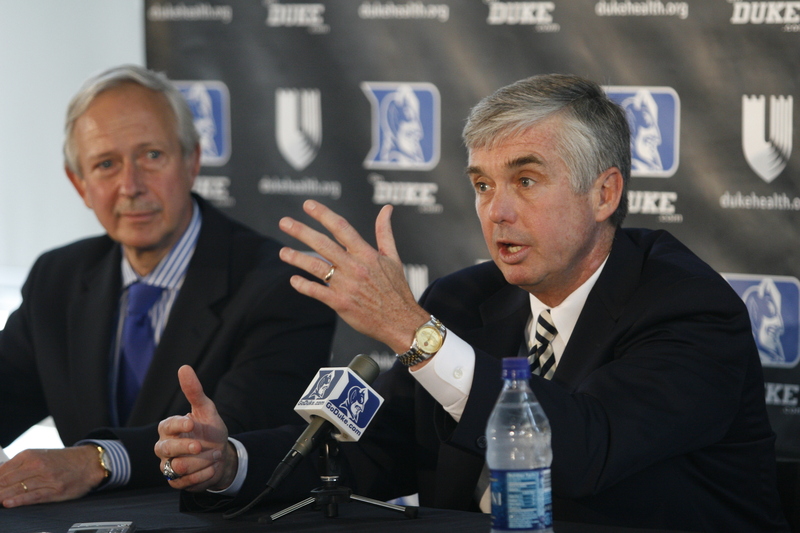 The search for Duke’s next athletic director is “well underway” and the committee plans on making its recommendations to President Richard Brodhead in June, vice-chair Richard Riddell told The Chronicle Thursday. The committee with a diversity of backgrounds does not have a predetermined number of candidates it will recommend to Brodhead, who will meet with the nominees and then make a decision. Riddell confirmed that Bill Carr and Associates, a consulting firm that helps with searches like these, has assisted the committee in identifying and doing research on a pool of candidates. The committee is chaired by Roy Bostock, the chairman of the board of Yahoo! Inc. Interim Director of Athletics Chris Kennedy took over for Joe Alleva, who became athletic director at LSU in April.